For a number of years, Old Sleningford Farm have been producing apple juice and cider for their own consumption and have offered the use of their equipment to others to make their own too. Many of the apples have been collected from local trees and orchards, many that would just have gone to waste. As well as having the juice and cider available to members, we will continue to offer open days for people to make use of the equipment. Rachel can also offer to process any fruit on behalf of those who have apples and don't want to waste them, and pasteurise any juice made. See the Old Sleningford Farm website for details of the open days. Rachel also works with Ripon Community Link and The Walled Garden Scheme in Ripon, who have members with learning difficulties. In 2009 they started 'Fruit to Juice' where they went out collecting apples from people who had an excess and utilised the apples from the Walled Garden orchard to make apple juice. The juice, plus other apple preserves, are on sale at The Walled Garden. 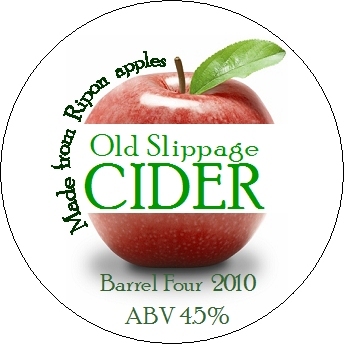 Old Slippage Cider is now available! On sale through Weeton's in Harrogate and whenever Rachel has a stall at a fayre etc. Barrels available for Beer Festivals, please get in touch if you're interested.